Mouse Traps are very effective at controlling mice infestations and provide peace of mind knowing that the measures you have chosen are working. 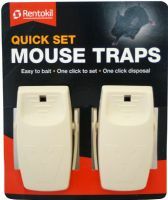 Our powerful Mouse Traps ensure that you are not left with the unpleasant task of killing the mouse yourself. Mouse Traps are ideal in chemical sensitive areas and where exposure to poisons is a risk to non-target animals. Not all mouse control products have to result in death. Humane Mouse Traps are a safe, friendly way to deal with unwanted mice. Simply locate your baited trap where mouse activity has recently been observed and wait for the mouse to be captured. Once captured, release the mouse at least a quarter of a mile away to ensure it does not return. Long-lasting powerful, reusable, easy setting metal rat trap with a powerful action and 8mm long metal teeth. High quality live catch mouse trap made from galvanised steel designed to catch and hold up to 10 mice at the same time. This high quality and robust snap trap from Rentokil is quick and easy solution to any mouse infestation internally. The Rentokil Advanced Mouse Trap is a long-lasting alternative to bait and is highly powerful, simple to set and re-use-able. 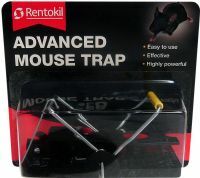 This high quality and robust snap trap from Rentokil is quick and easy solution to any mouse infestation internally. The Rentokil Advanced Mouse Trap is a long-lasting alternative to bait and is highly powerful, simple to set and re-use-able. Each pack contains 2 mouse traps. The Quick-Set mouse trap from Rentokil can be set and released with one simple click, allowing you to dispose of the mouse without touching it. Delivering high catch rates, this trap is perfect for eradicating mice internally. Each pack contains 2 mouse traps. The Rentokil Seal and Kill Mouse Trap is an easy-to-set enclosed mouse trap which dispatches mice quickly, cleanly and discreetly. 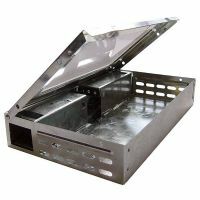 The Seal and Kill Trap locks the dead rodent inside the unit, enabling you to dispose of it hygienically without making direct contact with dead mice. Each pack contains 2 mouse traps. 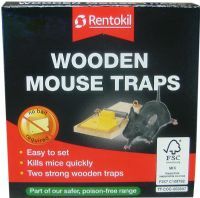 The Wooden Mouse Trap from Rentokil is a high quality and effective traditional mouse trap for the eradication of mouse infestations internally. The intelligent design and robust materials ensure that once triggered the mouse will be caught. Each pack contains 2 mouse traps.